Jefferson Bo Bailey didn’t have a tortured rock star-ready childhood, but that doesn’t mean things have been easy. He’s the oldest, the most educated, the least musically versatile, but still Bone Cold–Alive needs him for his voice. What he needs he keeps looking for in all the wrong places. Anya Celeste Smith is a gifted dancer, just not the ballerina she always wanted to be. New York didn’t work out and now she has one more year in LA before doing what she told her family she would: come home to Texas. The choreographer job with Bone Cold–Alive could be an answer to prayer except for one little thing: respect is not on the menu. She is. 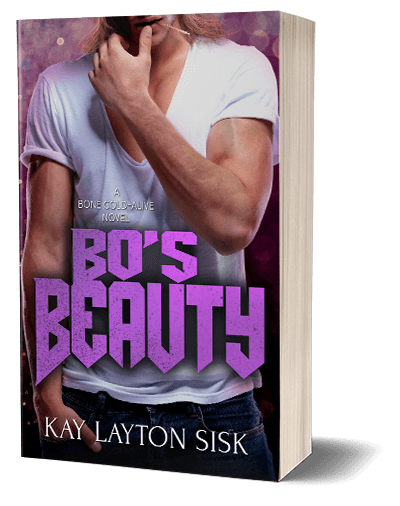 There’s a conspiracy afoot to stamp ‘paid’ to the trifling ways of the last bachelor in the group and the only one who doesn’t know it is Bo’s Beauty.